Devoid Of Culture And Indifferent To The Arts: Recipe: Sweet Onion Tapenade, with No Olives! This step differs from any other tapenade I know. Strain the liquid and boil to reduce it. I created this recipe because our Autumns in Atlantic Canada tend to be quite glorious through to late October. As such, there is still be plenty of opportunity for walks where good sandwiches may be a distinct advantage. To make a wonderful sandwich to take with you on treks purchase decent bread (chiabatta is nice), some Genoa salami (hot or otherwise) or other good Italian meats. Layer the sandwich with the meat, slices of provolone cheese and then some tapenade. That’s it. 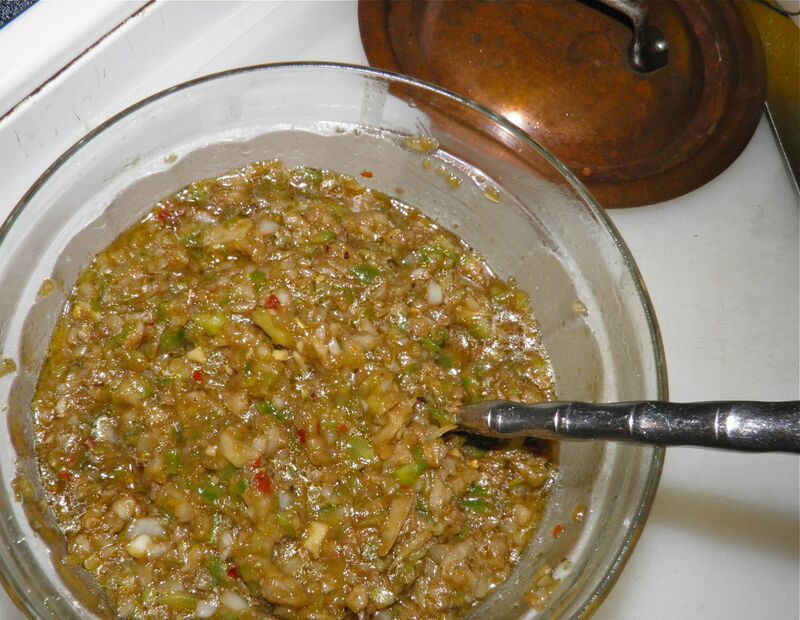 Make this tapenade the night before so it chills and the flavours have a chance to meld. All you have to do the next day is take it from the refrigerator – as easily as you would your jar of mayonnaise. Keep the mayo in the ‘fridge. You won’t need it. 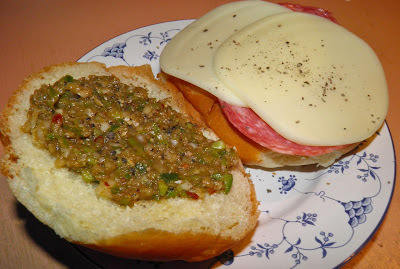 This tapenade is quite sweet and accompanies hot or cured meats very well. There is no added sugar. The sweetness comes from the reduced onion juice and balsamic vinegar. Together they lift a sandwich from ordinary to extraordinary! Of course it can also be served with pita chips or as a topping on crostini with goat cheese. I'm certain people will be asking you for the recipe. 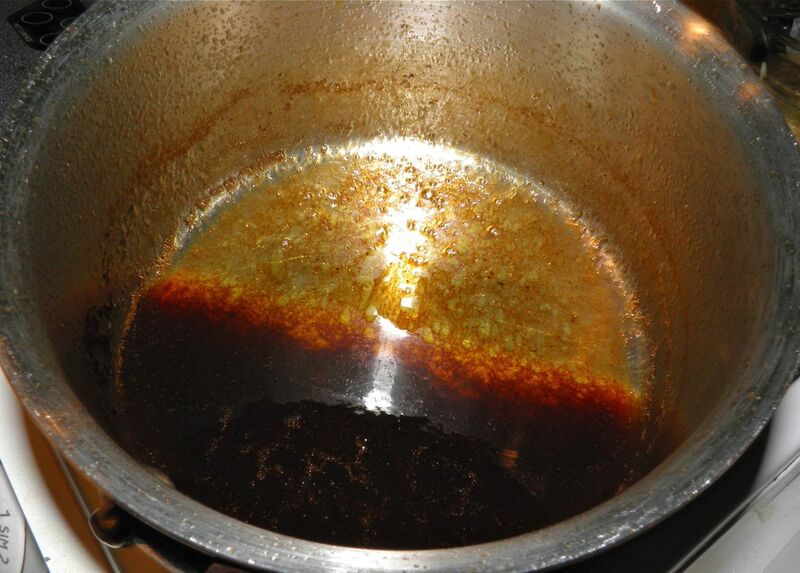 The resulting reduction of the strained liquid. Combine the oil and vinegar in a food processor and process. The mixture will thicken and become light. Chop the onion into medium to small pieces. Seed and chop the green pepper in the same way. Add to the olive oil mixture and pulse until chopped fairly fine or to your liking. the finer you grind the more paste-like it will become. I left mine "chunky." 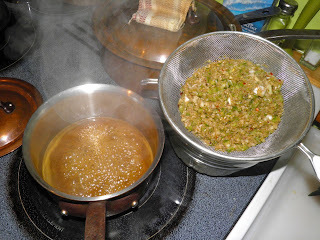 Drain the liquid from the vegetables into a small saucepan. Quite a lot of liquid will probably come out. Boil down the collected liquid until it is reduced to about 1/3 cup. It will thicken and darken considerably. Pour the reduced liquid over the vegetables. Add the oregano, chilli flakes and pepper. Mix well to combine. Taste and add salt if desired. Place in a container and refrigerate. This tapenade will last, covered and refrigerated, for about one week.